The next four entries are from last week in Seattle. Facilitation Skills training in Seattle, teaching court practitioners how to facilitate training sessions around an online curriculum. One day of travel home. I stayed at a hotel in the South Center, near the airport so I had to really work to get downtown. Shuttle to the airport. Light rail to the last stop. A bus and some walking took me to Mockingbird Books. Sue Nevins was prepared for me, having looked up information about Open Wounds on my website. This has never happened before. I don’t have to pitch. She has questions already ready for me about where to place the book shelf-wise based on language and content. Sue is incredible. The store is a beautiful bookstore thriving selling children’s books, with a small café and children’s play area. 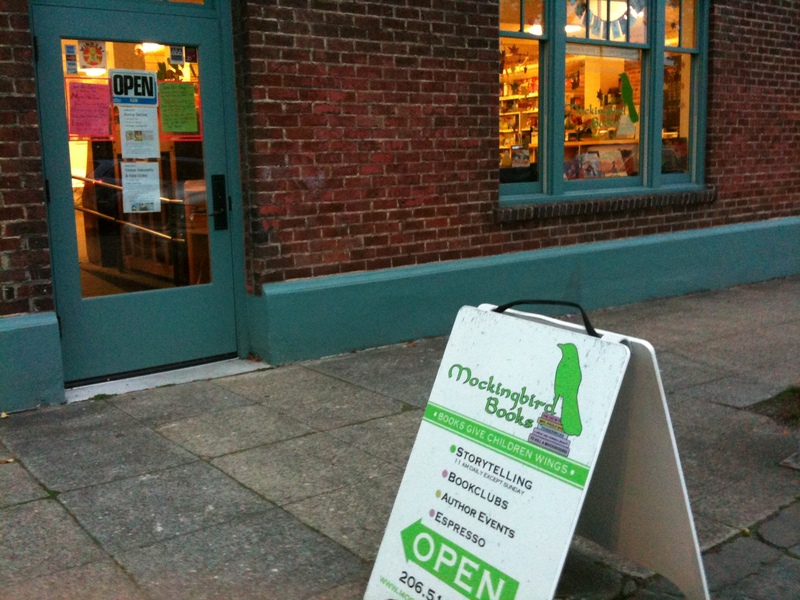 If we lived in Seattle we’d be hanging out at Mockingbird. And Sue knows her books. For almost half an hour she gave me a tour of books that my son might like. I left with four. He got Amulet: Stonekeeper Book 1 (a beautiful graphic novel of mystery, spookiness, and adventure), Sticky Burr: The Prickly Peril (graphic novel about burrs – work with me on this it’s very funny and cute and good for budding artists with graphic novel potential), Merlin (Merlin’s story at the age of 12) and Virus on Orbis One (science fiction to give my son something a little different for him to chew on). I should do a better job of planning these things out. My publicist (JKS in the hands of Sami Lien who does all the finding of bookstores I should hit and contacts them to see if they’ll take a visit with a smile and calls the fencing salles too) draws a big net. I’m ambitious but come up against the constraints of time and transportation every trip. Sue told me I should go to Third Place Books also because it was in walking distance – only about twenty minutes – and they had a good pub underneath them. I was thirsty and I needed to eat dinner. The three-hour time difference was knocking me out. 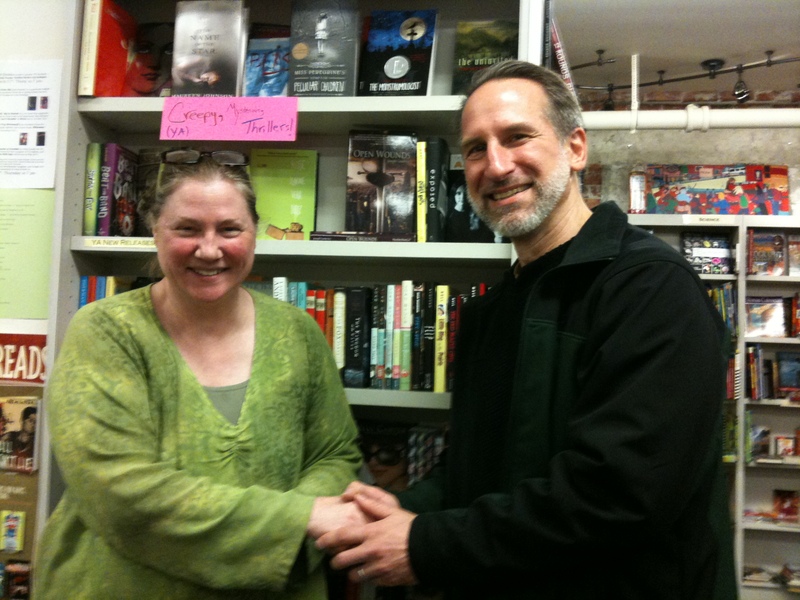 At Third Place I talked to the owner, Michael Ravena, and he seemed pleased both at Sue’s referral and to listen to me talk briefly about Open Wounds. He read a few pages of different parts of the book while I watched, and smiled at a description of Nicolai Varvarinski. “That’s great,” he said. With a handshake and a thank you, I asked for directions to the pub. The beer (Seattle has a lot of home local brews) was good and the food was even better. The World Series was on the television – no world cup rugby but that can wait until early Sunday morning when France and New Zealand will remake the clash of the titans. This entry was posted on October 24, 2011 by Joe Lunievicz. It was filed under Blog, Bookstores, JKSCommunications, Publicity & Marketing, Travel . I’ve read both Merlin and Virus on Orbis One. They are both excellent books. Amulet and Sticky Burr were also excellent (though wildly different). My son is half-way through with Virus on Orbis One so I’ll probably tackle that next. Thanks for the comment and checking in on my blog! I wish I would have known you were going. I could have told you where to eat (and drink). I wish I had remembered you had lived there. I ate at serious pie which was good but the pub beneath third place books was awesome. Hey… Did you watch the final of the world cup? I watched in a packed not-able to move bar with a ton of Frenchmen and women and a few new zealanders. It was a brutal nail-biter and great fun to watch even if I had to get up at 2am to watch.